I am guilty of buying “one of” plants. Then I plant these “one of” plants and hope that they will be seen and admired for their individual beauty. Sometimes these “one of” plants get lost in the shuffle, perhaps overtaken by a bigger, more aggressive “one of” plant that spreads itself out in the garden. Or even worse, they get stepped on by me when I’ve forgotten where I planted a “one of” plant that I thought I had to have. And I did have to have that "one of" plant at the time I bought it, at least until the next “one of” plant caught my eye. But after seeing the gardens at the Chicago Botanic Garden and wandering twice through the Lurie Garden at Millennium Park in downtown Chicago, I can see that the “one of” method of planting has its limits. 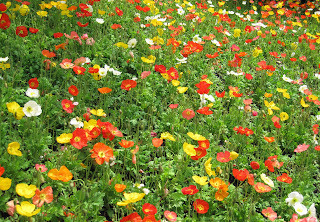 It will hardly stop you in your tracks like this field of poppies at the botanic garden. 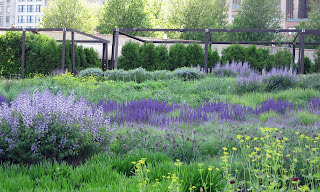 Or the entire Lurie Garden. And though I could not even begin to create the Lurie Garden in my backyard, I can learn from it the power of planting more than one of a particular plant to make a grander display. I believe I’ve actually learned this lesson about ten times in my gardening life, but this time maybe it will stick. If wishes were as plentiful as the seeds of the cottonwood trees which drifted through the air wherever we went in Chicago during the Spring Fling this past weekend, I’d plant a LOT of these five plants that I saw at either the Chicago Botanic Garden or the Lurie Garden in my own garden. I first saw this blooming at Mr. McGregor’s Daughter’s garden, and then later saw them at the Chicago Botanic Garden and the Lurie Garden. I think my comment on seeing it each time was “Why don’t I have that in my garden?” Why not, indeed? These were blooming in the English walled garden at the Chicago Botanic Garden. So often the flowers we enjoy in the spring are at ground level that it would be nice to have a grouping or two or three of these towering above. 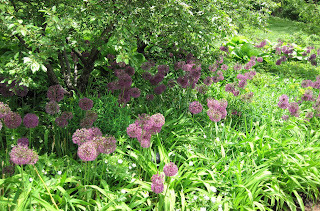 Alliums were everywhere we looked in Chicago. I have a few in my garden, but I clearly need many more than a few to make a grand display. Remind me to order several dozen for fall planting. I didn’t even see this in bloom but I like how the plant forms a nice rounded shape with no pruning. I don’t even care what the bloom looks like, I just like the shape! Okay, I care a little bit about the bloom, but I’m sure it isn’t something horrible. I actually bought three pots of Salvia x sylvestris ‘May Nights’ earlier this spring, which is more than the “one of” that I usually plant. I think I may add several plants each of ‘Rugen’ and ‘Wesuwe’, also growing in the Lurie Garden, to my own garden. If I get enough of these plants, I should be well on my way to reforming my “one of” ways! I often buy just one of a plant, and then divide it in a year or two. and remember, plant them together in a drift or a triangle. For impact, darling. The Lurie had a powerful effect on all of us, I think. I wish I had that kind of topography to work with! I'll be eager to see how you apply the lessons learned this weekend. Just think how fabulous all those plants would look in the new bed you've been planning! On the other hand, it's very easy to let a vigorous plant spread for the sake of effect. I have a couple of real stunners that make a show, but have less variety. Carol — I'm with you; maybe this time these Chicago gardens will help me remember to plant in groups, if not drifts. I missed the calamint, so thanks for pointing it out. i am working on this same issue and your pictures are inspiring me more and more to start focussing a bit. gorgeous! I'm still learning this too. My first lesson was after first seeing Kerri's, (Colors of the Garden), drifts of spring flowers. They make such an impact planted in masses. I sometimes do what Kathy does, but usually I buy 3. Then one dies. Two of something looks much worse than only one, which you can then call a "specimen." I'll send you some Geum triflorum when I divide them this fall. Its a terrific little plant, carefree, pest resistant (unless you have deer), and one of mine even bloomed in January when the snow melted. And I almost forgot - the foliage turns red in autumn. I like your point. 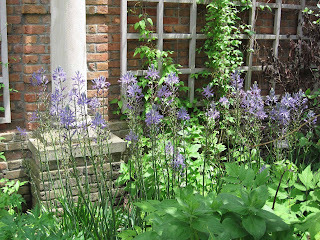 Often I buy one, of pricey plants, in hope that I can make more - divide plants or collect seed. It's a great idea with boxwood, IF you start this project when you are a lot younger than me. I'm also guilty of the "one of" misdemeanor but in a city lot, who has space for drifts? Except those Helianthus mollis. I can't seem to stop them from drifting. I have noticed I tend to take and post close-up photos, so nobody except me knows that my garden is a collection of specimens. Let me know if you find Wesuwe anywhere...I haven't found it online yet! Oh we all want drifts and drifts.............I know I do. But who has the room? I'm as guilty as the next person; I try to buy in at least groups of three, but six, or twelve would be even better. I try to never buy less than 3 "one of". Great post. Yep, guilty as charged. I am a "one of" planter but for a different reason. I always like to see if "one of" will grow in my garden where I want it, while all the time thinking I will purchase more if "one of" grows well. Yet i don't get "more of" when they do well. Like you say, they sure look outstanding when planted together. Carol, As I was looking at my two clumps of yarrow and comparing them to a photo of a drift of yarrow I realized I have to allow more room for a plant to spread. This post is a great reminder of the power of many instead of the interest of diversity. Did that make sense? I'm guilty of the same thing, Carol. Of course, we don't have the expansive gardens of the Lurie or the Botanic Garden, but still more than "one of" certainly creates a powerful effect. It's funny that we were drawn to much the same plants; I was taken by all of these, too, except for the camassia, which I somehow missed. On my list I'd add baptisia. I was thinking about the 'one plant ' problem the other day.I have the same problem, sometimes it is good to see if one will survive before I buy more, other times it is just sheer thriftiness... /cheapness! Carol, I was going to say I have the same problem, then I read the comments. We are not alone! But you are right, and the massed plantings are spectacular. Try baby steps - "3 of" or "5 of." It was so enlightening reading all the comments. Sounds like we all do the same thing. The gardens are beautiful. It must have been a great experience to see them while at the Spring Fling. Very thought-provoking post, Carol- read it yesterday, deleted the original comment and decided to think about it awhile. Why don't I have more drifts? I saw those Lurie gardens and know how cool it looks. It can't just be about money because occasionally some plant has grown enough to make a large dramatic swath in my garden, like the Shastas this spring. So what did I do? Admired them for about a week than got bored, dug up half of them and turned the new "Blank Spot" into a daylily-salvia bed. Apparently this is not a display garden - it's a playroom. So no reform here, but it will sure be interesting to see whether you can do it! I usually buy three which I did yesterday and when I placed them in the garden I wondered why I didn't buy five! Drifts are so satisfying and the Geum needs to live here also. 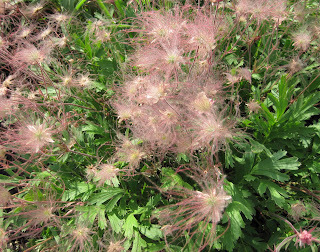 Do you think it is okay to plant 'Prairie Smoke' away from the prairie? How true, Carol. I'm trying to wean myself off buying 'one of', which is great fun, as it is an excuse for buying yet more plants! Beautiful photos. Add my name to the list of "one-of" offenders. I think my problem is being too tentative. I am afraid to commit to a drift of plants that may fail and break my heart. But that is no excuse--I need to be a gutsier gardener! Okay, I don't know 'Wesuwe,' unless it has some other English-language cultivar name that escapes me... but I have to put in a plug for you to grab 'Caradonna' if you're looking for a taller salvia. 'Caradonna' has dark purple stems AND purple flowers, and the effect is magical--the stems really make the whole plant glow with an intensity that you just don't see on 'May Night' and all the rest! hi carol. I have "one of" those calamints. I never thought to group a bunch of them. 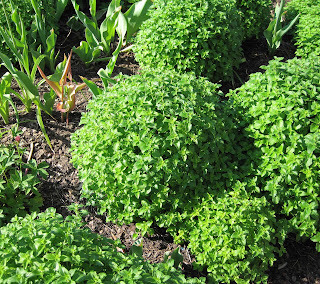 it's a wonderful plant with great minty fragrance. and the blooms aren't awful at all. they are quite wonderful...small and white with little purple dots that mark the petals. the blooms remind me of a puppy's face. and the plant is virtually carefree. i understand you're trying to change your "one of" ways. but just "one of" calamint is certainly worth a try. I plant one-of for a couple reasons: 1) I want to study it without having a huge mass to tend to - how does it behave, how does it add to my garden, and where should I place it? 2) I don't want to waste money on a bunch of duds - one dud is expensive enough, 3) I hope to divide over time - and if that doesn't work, I buy more of what I like and add to the area I have the other planted in to make a drift, 4) I love too much!!! Prairie Smoke is easy to grow. I am in zone 4 (disclaimer, I am located on the prairie). I got mine (a large swath of it - you'll be proud to know) from a local native plants nursery. It is growing in part sun under a large maple and loving it! 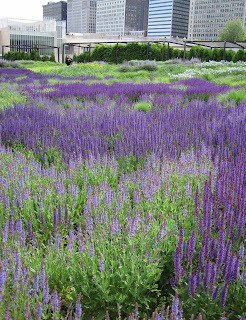 I second the suggestion for Caradonna salvia (in fact I was going to suggest it before I even read the other comment!). It is beautiful and well behaved. It stays upright and doesn't seed out everywhere. My favorite salvia. It does not multiply well so do not get one-of. I'm a "one of" person, too but I'm not going to reform any time soon. Or at least not with expensive perennials. Maybe I get my "drifting" out of my system in the spring with my displays of larkspur, cilantro and bluebonnets. As Sylvana says in the comment above, I like to take a plant for a test drive first, to see how it survives in my garden. Most don't--not in the long run. But I think I'm also a lot like Annie. I like to grow a lot of different plants and would get bored with a bunch of the same kind. It all comes down to the age-old tension between those of us who love plants first and worry about design second and those who design gardens first and worry about filling them in with plants second. I enjoyed your Chicago photos and commentary about "one of" plants. I try to cram lots in, and frequently buy only one of a plant because I fall in love with it on the spot. I've been noticing how good more than one of a plant looks, too. Another thing I do is have several of a plant, but spread them out. Now, why do I do that? I think I don't want to look like I'm trying to landscape. Also, I am a hodge podge type of gal. I wonder if I'll ever change.